We just returned from New Zealand! We were invited to present at the BA Development Day (aka BA Dev Day) in Wellington and half-day symposia in Christchurch and Auckland, NZ this month. I delivered one of our most popular presentations, From Order Taker to Influencer: Becoming a Trusted Advisor. This year’s BA Dev Day, held at the Te Papa Tongarewa Museum of New Zealand, challenged attendees to think and act outside of the BA Box and provided tons of tools and techniques for implementing change. For those who couldn’t make it to the main conference, the mini symposia in Auckland and Christchurch provided additional opportunities to connect with many BA’s throughout New Zealand. We were excited to have been invited to participate, share our experience, and learn from the other BA’s in attendance. We were also thrilled by the high level of energy and engagement of the BA’s at all three events! In addition to the great participation, we also got a treat in the form of visual notes and “Mind Designs” created by a couple of the attendees. Visual notes are a fantastic way to summarize a presentation, conversation, or results of an elicitation activity. Although informal, visual notes require the ability to focus, synthesize lots of information, paraphrase, make sense of new information, and present it back in a way that’s visually appealing and true to what was said. The two people at the conference assured me that it is not necessary to be an artist, but I think a sense of design and color help. 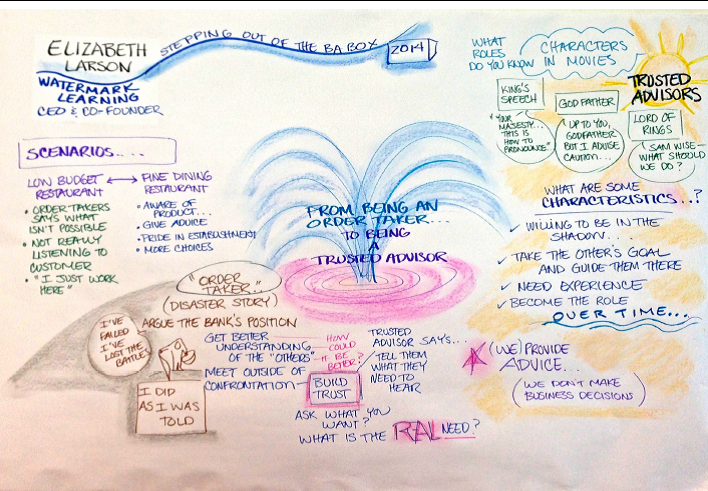 Lynne Cazaly created these visual notes from the Order-Taker to Trusted Advisor workshop in Wellington. Here’s another “Mind Design” by Jana Lyn-Holly, mapping my presentation at the Auckand Symposium. Check out more of our upcoming presentations and webinars!